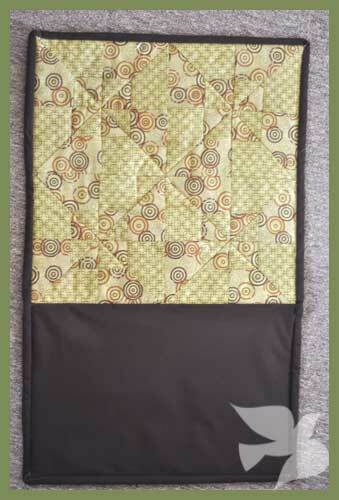 My cousin recently had a baby, so as part of her gift, I made her a change quilt (I was a bit absent-minded and forgot the nappy pocket – oops!). 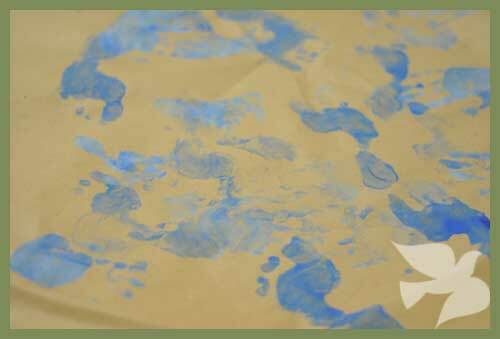 And to wrap it, I grabbed a piece of brown paper I had lying around, and, coating toddler sized feet in various shades of blue paint, let the boy run wild! I did try getting some baby prints on there too, but the small one wasn’t too keen, so he lay on a towel nearby & watched the fun. Unfortunately, the toddler failed to grasp the concept of “sit still and don’t touch anything with your feet”, so our back concrete is now also decorated. Oops. Hopefully it will come off… Or else we can just enjoy blue concrete until we get around to doing up the back yard! Bear really enjoyed making this paper, so I’m tempted to grab an old sheet & so paint & let him go wild – then use the sheet to either make a tent, or just chuck in “cubby house building” pile – depending on motivation levels! ← Another Reader for the Challenge.